ANN ARBOR, Mich. - Michigan football has the No. 8 recruiting class in the country in 2019 and the top class in the Big Ten, and eight of those players have already enrolled at the university this semester. Head coach Jim Harbaugh provided an update on that group during Tuesday's episode of the "Attack Each Day" podcast. "I've really liked that our eight mid-year players are spending so much time around Schembechler Hall," Harbaugh said. "It's their friend. Cade McNamara and Erick All, Zach Charbonnet -- they've all been doing a lot of work around Schembechler Hall." McNamara is the latest in a long line of four-star quarterbacks Harbaugh has brought to Ann Arbor. A record-setting passer in Nevada, McNamara was the No. 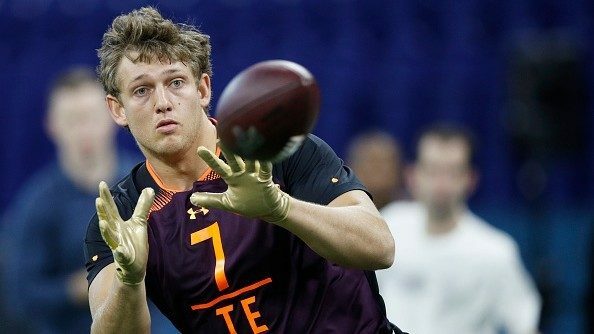 11 pro-style quarterback in the class and the No. 1 player in the state. He joins a loaded quarterback room that already has returning starter Shea Patterson, rising sophomore Dylan McCaffrey and redshirt freshman Joe Milton. 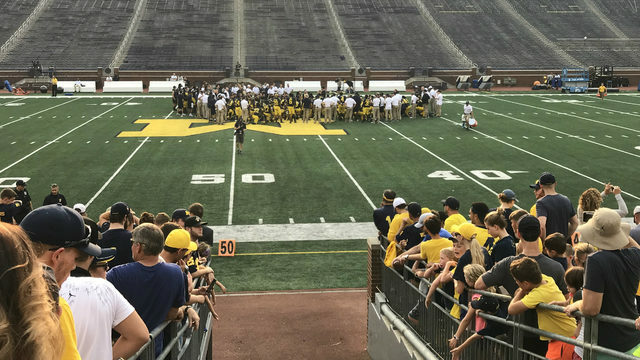 "Cade's really been organizing guys to go out there," Harbaugh said. Charbonnet is the No. 4 running back in the nation and the top-ranked player among Michigan's early enrollees. He's the No. 47 player in the class and should compete for the starting running back job this offseason. All is the only tight end in Michigan's 2019 class, and at 6-foot-4, 225 pounds, he ranks as a four-star and the No. 13 nationally at his position. 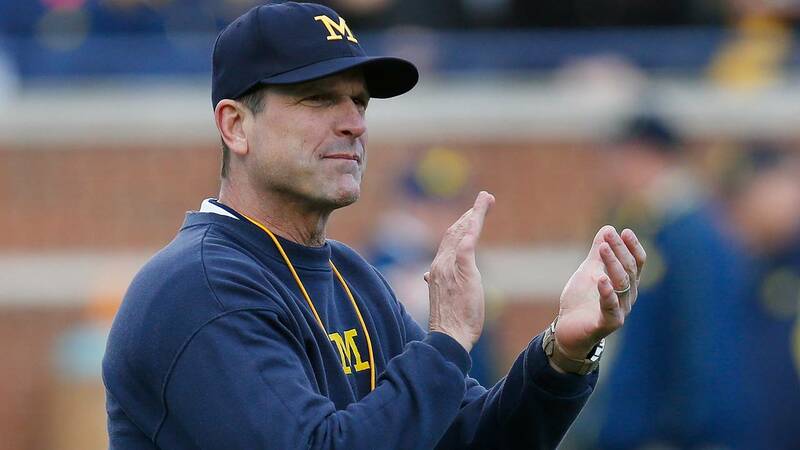 "Also, Jalen Perry's been out there throwing and doing defensive back drills," Harbaugh said. "Mikey Sainristil is out there catching and playing." Perry is the top defensive back in the class, a four-star from Georgia who picked Michigan over the likes of Alabama, Georgia, Clemson, Auburn, Florida State, Notre Dame, Ohio State, Oklahoma and Penn State. He's the No. 22 cornerback in the nation and joins a crowded defensive back crop from Michigan's last two recruiting classes. Sainristil was the No. 1 player from Massachusetts and the No. 64 cornerback in the nation. He's expected to play wide receiver at Michigan, though, to take advantage of his speed and athleticism. Michigan's top in-state commit, defensive tackle Mazi Smith, is also enrolled. "Mazi Smith, you know, just has been champing at the bit to get into the weight room, and he finally got into the weight room -- and he is strong," Harbaugh said. "He is strong. Ben Herbert's already talking about that. "Gabe Newberg, the same way -- just an outstanding competitor." Smith is one of the most important true freshmen on the team, as he plays a position of great need. 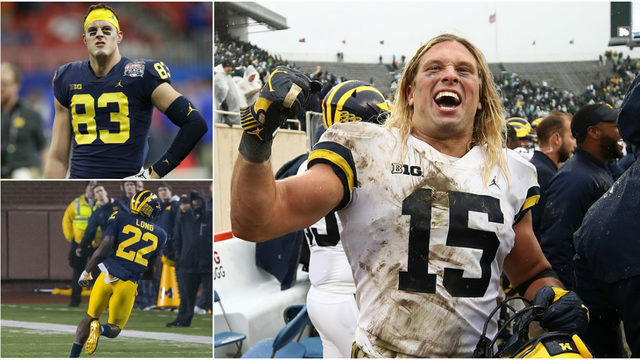 Michigan not only lost its top edge rushers in Rashan Gary and Chase Winovich, it also saw Bryan Mone graduate and Aubret Solomon transfer to Tennessee, leaving holes across the defensive line. As an early enrollee, Smith could have a head start in earning playing time as a true freshman. David Ojabo, a four-star defensive end from New Jersey, is also enrolled and could give Michigan depth on the defensive line. He's a raw player who only recently started playing competitive football, so these will be valuable months of development for Ojabo. Newburg is a three-star defensive end from Clayton, Ohio. He chose Michigan over a handful of other Big Ten schools, including Michigan State and Iowa. "Theses guys have got -- I coined this phrase a couple weeks back, and I got it from one of the recruits -- they said they're coming here to make Michigan great and make themselves great," Harbaugh said. "That's about all you can ask for. "They're getting along good together. They never have a greater opportunity as the seven other mid-years that they come in with. That group of eight have each other. They have that and they're a team within this football team, which is a team within the university. "They've done a great job recognizing it. They move together. They get to class early. They eat together. They're rooming together. The dynamic has been really good." Michigan's 2019 class includes 17 others who signed letters of intent in December and two players -- Quinten Johnson and Amauri Pesek-Hickson -- who are committed but unsigned. Harbaugh said those players have been texting the mid-year players about campus life. "The other youngsters who didn't mid-year, they're texting the guys that are here, you know, 'What's it like? What are you doing? How's the food? What have you been doing?'" Harbaugh said. "It's kind of almost been a daily thing." Harbaugh said he had the eight mid-year players over to his house to watch the New England Patriots playoff game. "Even mom said, it's just such a good group of young men," Harbaugh said. "Polite, good guys that -- don't you get the feel that they really have some goals?" Michigan recruiting director Matt Dudek said this group is the closest he's ever seen from a recruiting class. "This is the closest recruiting class amongst themselves I've ever seen," Dudek said. "I'm on a group chat with all of them -- all of the signees, all of the commits -- and just the way they interact with each other, they're brothers already. They're coming in knowing each other." Dudek said the players talk to each other every day and have met each other during recruiting visits. "They're coming in knowing, 'I want that guy to be my roommate. I'm excited to share a locker with that guy. I can't wait to hang out with that guy and play video games,'" Dudek said. "I mean, they know already." Harbaugh's father, Jack Harbaugh, who also does the podcast, has his own expectations for the new recruits. "My vision -- there's two factors to this vision -- the first vision is four years down the road," Jack Harbaugh said. "Four years from now, we're celebrating a national champion team and there will be two or three All-Americans on that national championship team, and they'll be standing as one of them is being presented the Heisman Trophy -- and it'll be those eight in the room celebrating whomever is receiving that and they'll be able to talk about this January when they came in as eight and made their presense on our campus. That's the first vision. The second vision is, more importantly, that I'm here to be a part of it." Jim Harbaugh said recruiting has changed drastically since he was a player at Michigan. He said there weren't official visits and the recruits didn't know each other as well before arriving on campus. "You knew the ones from your own high school league," Jim Harbaugh said. "You knew some guys that were in the same state. ... It's not like you called them or had the phone numbers. Now guys call with the cellphones and now guys text, and they direct message each other." With so many camps and opportunities for young players to compete, Dudek said players are more connected than ever. "They know each other before they even go to a school for an unofficial visit together," Dudek said. "They've already been to five camps."